Former Minister of Gender, Children and Social Protection and Chief Executive Officer (CEO) of Henry Djaba Memorial Foundation, Madam Otiko Afisa Djaba, has called for the condemnation and criminalisation of the harmful traditional practice of Female Genital Mutilation (FGM) on the African Continent. She said FGM, which is a community practice in Africa and in Ghana, especially some parts of the Northern, Upper East, Upper West, Brong Ahafo, the Volta Regions and the Zongo has no health benefits for girls and women but rather exposes them to health hazards and psychological trauma. Adding that, it causes severe bleeding, problems in urinating which can develop to cysts, infections, as well as complications in children and increased risk of newborn deaths, fistula in women during childbirth and maternal death. 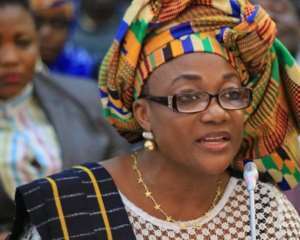 In a statement issued by Henry Djaba Memorial Foundation on 6th February, 2019 marking International Day of Zero Tolerance for Female Genital Mutilation and copied to Thepressradio.com, Madam Otiko Afisa Djaba stated that the law against FGM ACT 741 of the Parliament of the Republic of Ghana entitled Criminal Code (Amendment) Act 2007 provides for imprisonment and/or fines for both the circumciser and those who request, incite or promote excision by providing money, goods or moral support. The person commits an offence and is liable on summary conviction to imprisonment for a term of not less than five years and not more than 10 years. “The Foundation, on this occasion, urges the Security Agencies and the Judiciary to enforce the law and ensure that people who flout the law against FGM face the full rigours of the law to serve as a deterrent to others”. “We do not intend to condemn or undermine the culture of other people. However, the culture that violates the rights of the people is not worth practising. The practice of FGM has serious implications on the health of women and girls”. The statement added. She said Studies show that an estimated 100 to 140 million girls and women in the world today have undergone some form of FGM and two million girls are at risk from the practice each year. Although the current national prevalence stands at about 3.8%, while the Upper East stands at 27.8% which is far higher than the national prevalence. This increase could be attributed to the cross-border practice where people move into neighbouring countries to perpetuate this crime in the Upper East. Today, 6th of February marks the International Day of Zero Tolerance for Female Genital Mutilation. This day was set aside by the United Nations as part of its efforts to eradicate Female Genital Mutilation. Female Genital Mutilation is one of the ancient cultures which has been practised in Africa and other parts of the world for decades. History has it that the practice of FGM came from neighbouring countries such as Burkina Faso, Mali, Niger and Togo into Ghana. In Ghana, some parts of the Northern, Upper East, Upper West, Brong Ahafo, the Volta Regions and the Zongo Communities in certain urban centres of the country, are notable places where the practice still goes on. It is clear that the adoption of that culture has not served any good purpose in our country. Culture is what makes us unique people and makes others identify who we are. Culture is dynamic and where and when we realize that it impacts negatively on the people, it can change with time. Therefore, a healthy and positive culture should be a catalyst for development. We do not intend to condemn or undermine the culture of other people. However, the culture that violates the rights of the people is not worth practising. The practice of FGM has serious implications on the health of women and girls. Friends of the Media, its implications on maternal health are huge on the individual and the nation as a whole. The practice of FGM has no health benefits for girls and women but rather exposes them to health hazards and psychological trauma. It causes severe bleeding, problems in urinating which can develop to cysts, infections, as well as complications in children and increased risk of newborn deaths, fistula in women during childbirth and maternal death. Ladies and Gentlemen, FGM is recognized internationally as a human rights violation of girls and women and further reflects deep-rooted inequality between the sexes which constitute an extreme form of discrimination against women. It violates the right to health, physical integrity, the right to be free from torture and cruelty, inhumane treatment and the right to live where it results to death. Studies show that an estimated 100 to 140 million girls and women in the world today have undergone some form of FGM and two million girls are at risk from the practice each year. Although the current national prevalence stands at about 3.8%, the prevalence in the Upper East stands at 27.8% which is far higher than the national prevalence. This increase could be attributed to the cross-border practice where people move into neighbouring countries to perpetuate this crime in the Upper East. Henry Djaba Memorial Foundation with its vision of contributing towards the creation of an equal and equitable society, which respects the rights and interests of all persons irrespective of gender, social class, religious persuasion or ethnic origins, wishes to mark this day with a clarion call on Government, Traditional Authorities, Civil Society Organizations and all involved parties to implement concrete actions and increase awareness campaigns against FGM. The Foundation condemns and frowns against the practice of FGM in Ghana. We cannot afford to allow our women and girls to be subjected to this risky, life-threatening, inhuman, degrading and shameful practice in this country. Women and girls have a right to their sexuality and must be allowed to be who they want to be. Ladies and Gentlemen of the Press, the law against FGM ACT 741 of the Parliament of the Republic of Ghana entitled Criminal Code (Amendment) Act 2007 provides for imprisonment and/or fines for both the circumciser and those who request, incite or promote excision by providing money, goods or moral support. The person commits an offence and is liable on summary conviction to imprisonment for a term of not less than five years and not more than 10 years. The Foundation, on this occasion, urges the Security Agencies and the Judiciary to enforce the law and ensure that people who flout the law against FGM face the full rigours of the law to serve as a deterrent to others. We want to encourage the media to use their tools for communication to create more awareness, increased reporting and to let the public know that the practice of FGM is a crime in Ghana.